Here we have a stunning Mazda MX5 in a metalic blue with black cloth interior. Only 1 previous owner and covered 38500 miles from new. Its condition speaks for its self and i can only believe this car has always been kept in a garage, as the bodywork is almost in perfect condition. The car has just had an MOT with no advisories which speaks for its self. The first keeper has had the car for the first 14 years of its life and is a true credit to them. I dont think you would find a better, more genuine vehicle for its age and miles. Mechanically superb and the drive is fantastic. Included in the sale is a 2 month warranty, a clear HPI and national mileage check and a VOSA MOT report detailing its past MOT history from new. Specification includes power steering, cd player, central locking, electric mirrors, alloy wheels, chrome roll over bars with wind blocker, airbag and immobiliser. 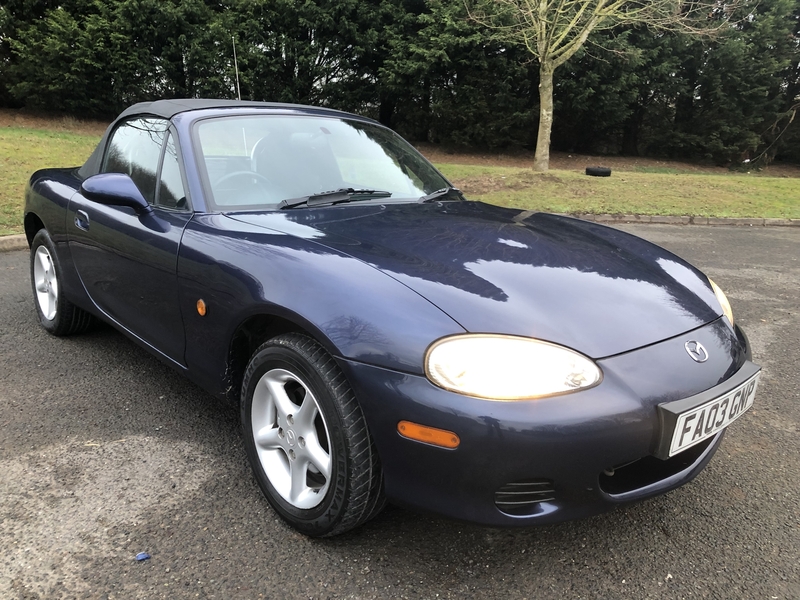 If your looking for a great value MX5 which has been cherished then this could be the car for you. Please feel free to call Steve to arrange a full inspection and demonstration drive. Part exchange is welcome. If you require a pre visit estimate please ask. Out of hours appointments always available. We can also supply nationwide extended warranties for 3, 6 or 12 months to suit your motoring budget.